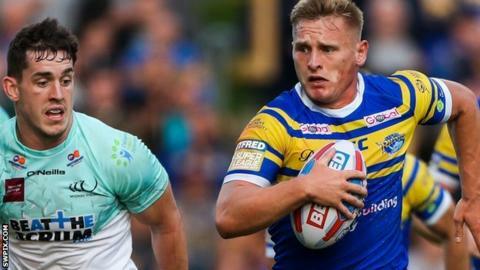 Leeds Rhinos ended their nine-match winless Super League run with a comfortable victory over lowly Widnes. The win, their first under director of rugby Kevin Sinfield, kept their hopes of reaching the Super 8s alive. Tries from Brad Dwyer, Luke Briscoe, Richie Myler, Matt Parcell, Joel Moon, Tom Briscoe and Jack Walker saw the hosts blow the Vikings away. Despite the win, last season's Grand Final winners could still find themselves in the Qualifiers. If Catalans Dragons beat Salford on Saturday and Wakefield beat Hull FC on Sunday, then the Rhinos will have to fight for their Super League spot for the second time in three seasons. In desperate need of a win, Leeds could not have hoped for better opposition, as the Vikings were without a win since March. The hosts were in total control once Dwyer showed great composure to beat three men and run in the opening score, while the visitors were down to 12 men after Danny Walker was sin-binned for a high tackle. Leeds end the regular season with a trip to Salford next Friday, while Widnes will hope to end their miserable run when they host Castleford a week on Sunday. Leeds: Walker, T. Briscoe, Handley, Hall, L. Briscoe, Moon, Myler, Garbutt, Dwyer, Singleton, L. Sutcliffe, Ablett, Cuthbertson. Replacements: Oledzki, Keinhorst, Crosby, Parcell. Widnes: Ashall-Bott, Ah Van, Runciman, Inu, Buckley, Mellor, Craven, T. Chapelhow, D. Walker, Dudson, Whitley, Hauraki, Leuluai. Replacements: Wilde, Wellington, B. Walker, J. Chapelhow.